Chan Master Wujue Miaotian was born in Taiwan and grew up during World War II. He lost his mother at a young age. The sufferings and impermanence he experienced during his childhood inspired his pursuit of spiritual awakening and liberation. He started his spiritual journey at the age of forty and vowed to dedicate his life seeking the true meaning of our existence by visiting and studying numerous practices. After years of searching and dedicated practice, he met the Eighty-fourth Chan Patriarch Master Jingzai. Under Chan Master Jingzai, he practiced the “heart-to-heart” teaching passed down since Shakyamuni Buddha. At the age of forty-eight, he attained ultimate enlightenment and became the Eighty-fifth Chan Patriarch since Maha Kasyapa, the Fifty-eighth Chinese Chan Patriarch since Master Bodhidharma, as well as the Forty-eighth Patriarch of the Linji School. The Chan Master has taught and propagated Chan since 1983 in Taiwan. He established numerous Chan Centers in Taiwan throughout the years. 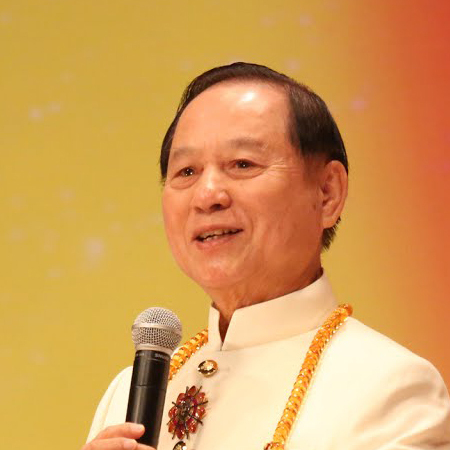 Tens of thousands people in Taiwan have benefited from his teaching. He also travel around the world to propagate Chan, including Japan, Singapore, Vietnam, China, the Philippines, Russia, Romania, etc., and exchanged teachings with leaders of other practices or religions. In the spring of 2001, the Chan Master asked his disciple Juemiao Younglien to introduce Chan around the Los Angeles area. Since then, many practitioners in California and across the U.S. has benefited greatly from the teaching. In July of 2011, Mark Troxell, an American nuclear physicist, who had studied and practiced many styles of Zen for 37 years prior, met and received Heart Imprint from the Chan Master through heart-to-heart transmission in Shanghai. The Chan Master also ordained him with the name “Juemiao Miaoming” and the leader of Heart Chan in the U.S.